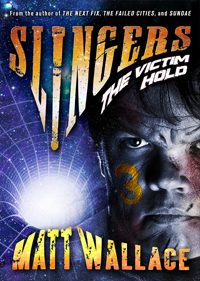 SLINGERS: THE VICTIM HOLD is the third ebook in the five-part Slingers Saga, an epic fiction serial by Matt Wallace, the award-winning author of THE FAILED CITIES. "Another slinger has fallen, and their death leaves haunting echoes that threaten to unravel the other members of their team, even as those same gladiators await the decision that will either take them to the championship match or see their hero's sacrifice in vain. Finally, the deposed crime lord of Sling City's lawless underground, Cuatro, has fled to The Victim Hold, a fabled nook of the space station purported to be its own circle of Hell. Battling the native demons of the Hold won't be his only challenge, however. Many factions are still hot on Cuatro's trail, and will follow him anywhere he goes, even into Hell's attic. Some of them want answers. Others want his life."